Former Secretary of State Hillary Rodham Clinton applauds Designer Ralph Lauren as he receives the James Smithson Bicentennial Medal for his embodiment of the American experience through the medium of fashion, design and philanthropy" Tuesday, June 17, 2014, during a ceremony at the Smithsonian's National Museum of American History in Washington. Ralph Lauren's love for the American flag and American style earned him high honors Tuesday from the Smithsonian Institution, celebrating his five decades in fashion. Former Secretary of State Hillary Rodham Clinton helped present the James Smithson Bicentennial Medal to the designer at the National Museum of American History following a naturalization ceremony for 15 new U.S. citizens. The award also marks the 200th anniversary of the actual flag that inspired the national anthem. Clinton noted that Lauren, 74, is the son of immigrants from Belarus who grew up in the Bronx, New York. "Now surely Ralph and his family ... could not have imagined, or maybe they could have when they landed in the Bronx, that their lives would be the embodiment of the American dream," Clinton said. "In particular, Ralph, the youngest, would become synonymous with American aspiration and style." Clinton wore a pantsuit to Tuesday's event that was Lauren's first-ever custom-designed outfit for her, including a cobalt-blue structured silk jacket. Clinton and Lauren first joined forces in 1998, when she was first lady, to raise money for the Smithsonian to preserve the original "Star-Spangled Banner" flag that inspired the national anthem, along with other historic artifacts, through Clinton's Save America's Treasures program. Lauren donated $10 million to help restore the flag and another $3 million to support the historic preservation program. "Ralph responded to the call. He didn't have to," Clinton said. "But he understood because it was deep within him that part of being an American is giving back." Lauren is known for designs that have defined American fashion and for his patriotic uniforms for U.S. Olympic athletes. He got his start selling ties from a drawer at the Empire State Building. 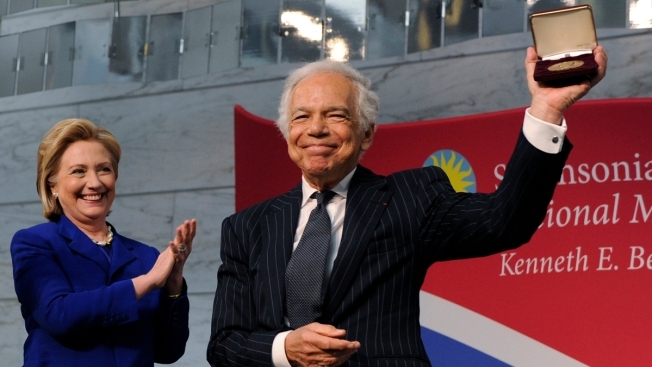 Now Ralph Lauren Corp. has 25,000 employees worldwide. The Smithsonian award citation honored Lauren "for his embodiment of the American experience through fashion, design and philanthropy."